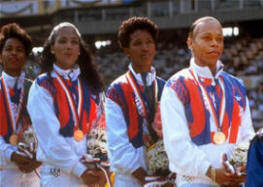 Alice Brown (far right) was a two-time Olympic gold medalist, as a member of the U.S. women’s 4x100-meter relay teams at the 1984 Games in Los Angeles (which included Evelyn Ashford) and the 1988 Games in Seoul (which included Ashford, Sheila Echols and Brown's former Cal State Northridge teammate Florence Griffith Joyner). Brown also won a silver medal in the ’84 Olympics, placing second behind Ashford in the 100m dash with a time of 11.13 seconds. She also was a semifinalist in the 100 meters and a gold medalist along with Echols, Griffith-Joyner and Ashford in the 4x100 meters at the 1987 World Track and Field Championships in Rome. A fast starter, Brown ran the first leg on the Mustang girls 640 relay team including Regina Jordan, Gwen Jordan and Lissette Milliner, which broke the CIF record in the 1975 Times Indoor Games at the Forum in Inglewood. The four came back the following year and broke their own record at the same event in 1976. Brown also won the 60-yard dash at the Long Beach Invitational during her junior year. A longtime member of the Pasadena Unified School District Board of Education (1979-2004), Elbie Hickambottom was one of the last graduates of John Muir Tech. He served his country in the U.S. Army during World War II as one of the youngest sergeants in Europe, and as a second lieutenant in the Korean War. In 1967 he was appointed as Director of Relocation and Property Management for the Pasadena Redevelopment agency and later as Senior Vice President of Municipal Services, a private consulting firm, until his retirement in 1985. Mr. Hickambottom will be forever remembered as a champion of excellence in education and a strong voice for improving academic achievement for all, particularly for disadvantaged and minority students. 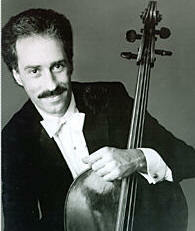 Nathaniel “Nick” Rosen is an award-winning cellist and professor of music. His cello was crafted in 1738 by Domenico Montagnana, the "Mighty Venetian." The instrument was previously owned by Adrien-Francois Servais (1807-1866) who invented the endpin. At the age of six, Rosen began studying with USC professor Elonore Schoenfeld. At age 12 his teacher encouraged him to move on, first intending to study with Gabor Rejto but, when it was announced that Gregor Piatigorsky was joining USC, Rosen auditioned and was welcomed into his studio and the newly created Institute for Special Musical Studies at age 13. He also studied chamber music with other renowned teachers that joined Piatigorsky and the institute, including Jascha Heifetz and William Primrose. At age 17, while a student at Muir, Rosen won a prize at the prestigious International Tchaikovsky Competition in Moscow. While a student at USC, he became a founding member and eventually principal cellist of the Los Angeles Chamber Orchestra. He also studied with Laurence Lesser. By age 22, the same year he graduated from USC, he had also become Piatigorsky's assistant — a post he maintained for five years. In 1977, at the age of 30 he became principal cellist of the Pittsburgh Symphony Orchestra under Andre Previn. The following year, he later became the second-ever American gold prize winner (after pianist Van Cliburn) at the Tchaikovsky Competition in 1978. The victory thrust him into the forefront of the classical music circuit. Rosen has soloed for, among others, the philharmonic orchestras of New York, Los Angeles, Philadelphia and Dresden, the Czech Philharmonic and the London Symphony Orchestra. He has taught at the University of Illinois, has been a faculty member for the Manhattan School of Music and currently teaches at USC. Gail Tusan Joyner is a well-known attorney in the Atlanta area, having served as president of the Georgia Association of Black Women Attorneys. She is a member of the American and National bar associations. From 1983 to 1985, she was vice chair of the Atlanta Exchange, a partnership of black businesses and professional organizations. In 1984, Governor Joe Frank Harris appointed Ms. Joyner to serve as a member of the Georgia Council on Vocational Education. That same year she was appointed by Atlanta Mayor Andrew Young to serve as an administrative law judge for the city’s Bureau of Taxicabs and Vehicles for Hire. In July 1986, she was appointed to serve as a part-time judge on the Magistrates Court of Fulton County, Georgia. More recently, Ms. Joyner has served as President of the Atlanta Legal Aid Society and is a practicing partner with the law firm of Joyner and Joyner. She renders pro-bono legal assistance through the Georgia Volunteer Lawyers for the Arts. Ms. Joyner co-chairs the Minority Liaison Committee of the Atlanta Council of Younger Lawyers of the Atlanta Bar Association. are being considered at this time. Inductees may be announced mid July.